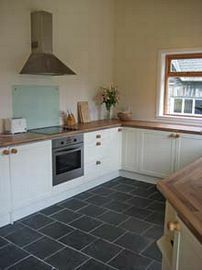 The Old Police House is a delightful holiday house in the heart of the picturesque conservation village of Kenmore, at the east end of Loch Tay. 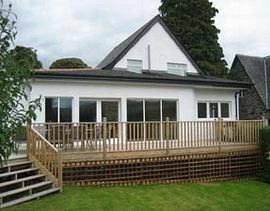 The newly refurbished property has a glass fronted extension overlooking a spacious decking area and private enclosed garden with beautiful views over Loch Tay. 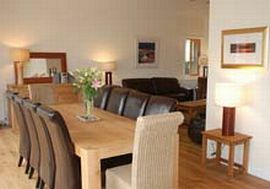 Furnished in a contemporary style, the house accommodates 10 people very comfortably, giving guests the opportunity to drink in amazing views and to enjoy the peace of village life. Toys, games, dvds and books. Beautiful glass fronted extension with fantastic views over Loch Tay. Power showers and modern bathrooms. Spacious decking and BBQ area. The Old Police House is located within a stones throw of the village shop, the Kenmore Hotel, reputedly the oldest inn in Scotland and close to the gates of Taymouth Castle, with beautiful riverside walks and golf courses. Watersports, angling and boating are all in the immediate vicinity with Loch Tay and River Tay on our doorstep! Beautiful Decking ; Dining area with views over the loch. Private Garden with dining on the decking and a BBQ. Local Services: Situated in the heart of Highland Perthshire in Scotland, Kenmore is a picturesque conservation village nestled on the shores of Loch Tay. The village is centrally located and can be reached within 2 hours from Glasgow, Edinburgh and Aberdeen. 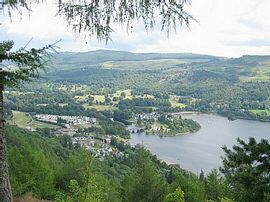 Kenmore is set deep in the heart of Rob Roy country and there are many activities and attractions on the doorstep, such as watersports, boating, fishing, golf, tennis, horse riding, mountain biking, mountain climbing, nature trails, whisky distilleries, castles and much more. The Old Police House is within a stone's throw of local bars and restaurants and Loch Tay. Close to the property is the Kenmore Hotel, reputedly the oldest inn in Scotland, and within minutes' of the house is the Courtyard bar and restaurant with a delicatessen next door. 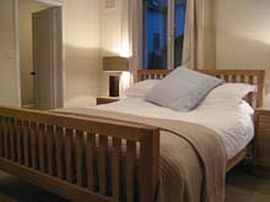 The renowned Ardeonaig Hotel is within driving distance of the house. Situated in the heart of Highland Perthshire in Scotland, Kenmore is a picturesque conservation village nestled on the shores of Loch Tay. The village is centrally located and can be reached within 2 hours from Glasgow, Edinburgh and Aberdeen. Kenmore is set deep in the heart of Rob Roy country. We rent out the Old Police House for weekends, during the low and mid season and on a weekly basis during the high season. Our rates range from £500 up to £1500.